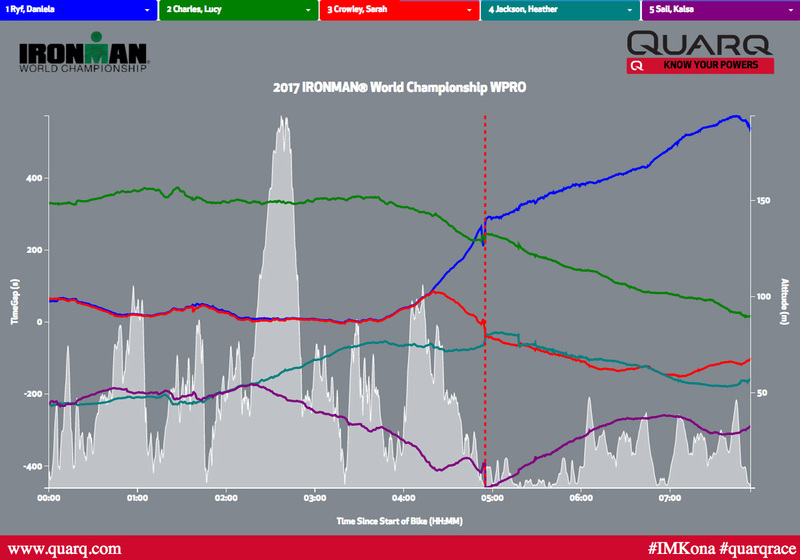 The tape has long been broken, the champagne sprayed and champions crowned at the 2017 IRONMAN® World Championship, but for the first time we have in-depth access to data that paints a new and dynamic picture of the day. What we saw on the live broadcast on October 14 didn’t fully capture the strategies and pacing that played out on course on a day that resulted in a new course record and several new names making the podium for the first time in both the women’s and men’s professional races. 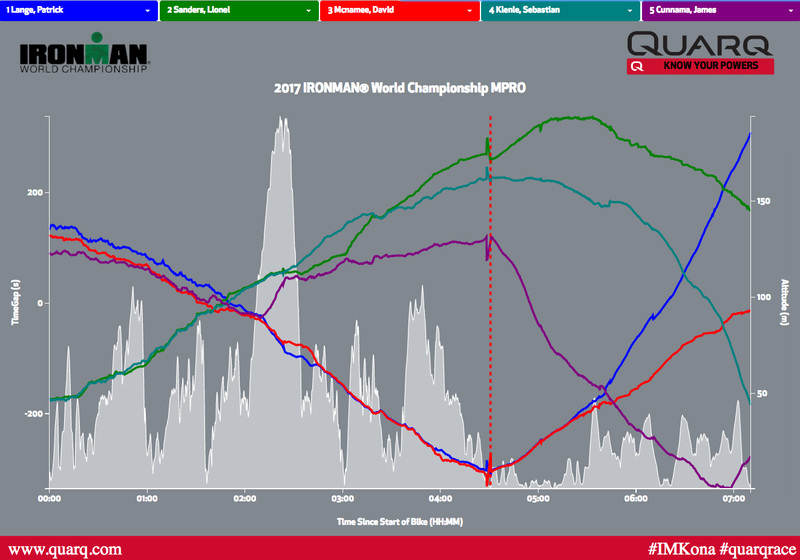 With the help of the Quarq and their Quarq Qollector, IRONMAN’s® Live Pro Race Tracking Partner, we were able to analyze real-time data, which we shared for various athletes live during the race through the IRONMAN® Live Blog. Additionally, we were able to study comparative data after the race, giving us valuable new insight into the pacing throughout the bike and the run for the top athletes in both the women’s and men’s races. We recently wrote about the power and pacing of Lionel Sanders during this year’s race. 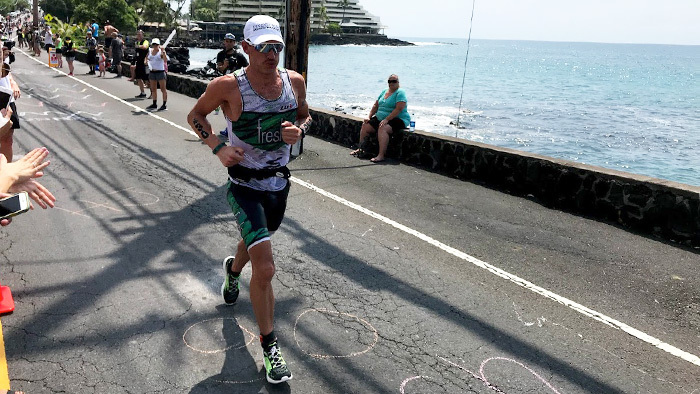 The Canadian pro cracked a major piece of the Kona puzzle on his third attempt by finishing second after being passed by eventual champion Patrick Lange at mile 23. Using the Qollector, we can put his effort into the larger comparative context and see how the fast pace of the bike played out favorably for strong runner Lange, but cost other top pros like Sebastian Kienle the top spot. On the women’s side, the data shows that despite being the heavy pre-race favorite, it was no cake walk for Daniela Ryf on her way to her third straight victory. We can see that she was fighting hard to stave off the hard-charging dark horse Lucy Charles for much of the bike and the run. Before we dive into the data for the men’s and women’s pro races, take a look at the interactive tool Quarq has graciously set up for everyone to use to compare pro athletes’ paces throughout the race. The left side axis shows the athlete time gaps, though the actual number is not as important as the relative time difference between athletes. The right side shows the altitude of the course. The bottom axis is a reference time for which the gaps are measured against. The most important thing to follow is the relative time-gap distance between athletes and the rate of time change.This shows where and how quickly things can change out on course. The initial separation of time indicates the starting gaps out of the swim. This data, our knowledge of some of the athletes’ additional data such as power, what we saw on the broadcast and what the athletes themselves said about the race can provide a deeper understanding of how the race unfolded. From the beginning we thought this was a race for second and third, with Daniela Ryf as a lock to three-peat, but the time-gap data shows that the race was anything but a lock—especially early on. Looking at the chart we can see that phenomenal swimmers Lucy Charles and Lauren Brandon (select Brandon from the drop down to see her data) came out of the water with a significant advantage on Ryf and third-place finisher Sarah Crowley. Having watched Ryf decimate the field on the bike at the IRONMAN® 70.3 World Championship we expected her to pull a similar move to Sanders, Cameron Wurf and Kienle and quickly reel in the leading ladies. To most people’s surprise Crowley and Brandon actually gained time on Ryf up to the turnaround in Hawi. Looking at the chart, the only athlete to gain time in the first 60 miles of the bike on the leaders was fourth-place finisher Heather Jackson. Fifth-place finisher Kaisa Sali hung on to Jackson until the base of the climb, where she fell off the pace and settled into a more consistent tempo settling for the final third of the bike course. Brandon and Charles held pace at the front of the race for two-thirds of the bike. Ryf was riding consistent fairly close behind them, but not to her normal standard, and Crowley was happy to sit in a ride with her. Just as Heather Jackson cut her overall deficit to the Ryf’s chase group to roughly a minute and a half, the rust came off Ryf and starting at mile 87 she started putting in a big effort, quickly distancing herself from Jackson and cutting into Brandon and Charles. Crowley held on to the pace until mile 100, then fell off sharply, losing back all the gains she had made on Jackson. As Ryf continued to push the pace Charles was starting to fall off. Brandon, who was keeping pace with Charles, suffered a mechanical (which can be seen as the sharp cliff drop on her data line). By the end of the bike Ryf had made up the five-plus-minute deficit and taken the overall lead heading into T1 over the course of just 25 miles. The question remained if this monumental final effort on the bike would impact Ryf’s run. In 2016 she decimated the field with a even all-around race and subsequently breaking the course record. Her pace starting the run was slower than that of 2016, but compared to her competition she was slowly pulling away. As it turned out her run of three hours was still enough to secure the best run split and the overall win, but a far cry away from her 23+ minute victory last year. For Charles her run was consistent throughout. She steadily lost time to the other podium contenders, but her ability to string together an amazing swim with a strong bike will have her in contention in most races as her run continues to progress. One story missed from the broadcast was the battle for the final podium spot. Looking at the time gap plot for Heather Jackson and Sarah Crowley you can see that they battled it out throughout the run, with the lead changing multiple times. Crowley was able to pull away slightly on the Queen K heading back into town, but the back and forth would have made for great viewing, and also shows once again just how critical those last few miles of the run back into town can be. For the men’s race we start by examining the top-five pro finishers. Much of the broadcast, and our own power analysis, focused on Lionel Sanders’ performance. Looking at the chart you can see why. 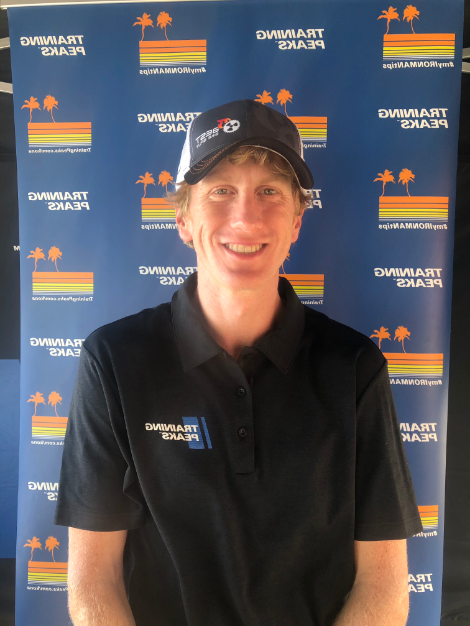 As expected he started with around a five-minute deficit on the swim compared to the large main lead pack which included Lange, third-place finisher David McNamee, Ben Hoffman, and others. While that is a large gap, Sanders was able to stay with two major allies in Kienle and former professional cyclist Cameron Wurf. In the Quarq tool, if you change McNamee to Wurf you can see how the three quickly bridge the initial time gap before the climb to Hawi. Before this pass the lead group maintained a similar strategy to years past where the group pretty much stuck together and conserved energy. If you add Ben Hoffman and Tim O’Donnell in place of Kienle and Sanders, you can see how close the pack stayed until Wurf made the pass. At this point there was a tactical decision to make as the race started up Hawi. This climb proved to be a pivotal point in the race. Athletes who tried to hang on to Wurf, Kienle and Sanders included previous podium finishers Hoffman, Odonnell, and two-time defending champion Jan Frodeno. Two athletes who chose not to go were eventual champion Lange and McNamee, who stayed to a more consistent plan. In previous years, this type of move didn’t occur until after the turnaround, and typically was a solo effort by Kienle—the new dynamic this year split the tactics. Having access to Sanders’ data we can estimate the efforts of all the athletes that matched the leaders’ pace up the climb. On the climb to the turnaround, Sanders actually lowered his averaged power compared to the effort he was putting out to catch the group from 325 to 315 watts. However, for him this effort represents less than 80 percent of his FTP, whereas for many of the athletes who chose to pick up the pace this effort is roughly 90 percent of their thresholds. Check out Lionel Sanders’ Kona bike file here. Holding such a high pace for the 20-minute climb is definitely doable for these athletes, but after the turnaround Sanders, Wurf and Kienle kept the pressure on, forcing the athletes who went with them to make a decision to push beyond their means or back off. One interesting note is that of all the people who went with the lead pack, James Cunnama was late to make his move, instead of pushing up the entire climb, he chose to bridge the time gap late in the climb and closer to the turnaround. While his effort was likely higher than that of the other chasers, it was for a much shorter time period, where he could potentially get some recovery on the descent. Once the decision to go was made there was no backing off for Frodeno, Hoffman, Cunnama or Tim O’Donnell until the lead group (including Sanders) put in a monstrous 365 watt effort up the 1.7 mile climb to Kawaihae. At this point the chasers fell off the pace, holding steady until O’Donnell made a sharper fall off pace heading into T2. The conditions on the day for the pro men were a bit more mild than typical; there were lower crosswinds and the prevailing headwind never materialized coming back into town. Most of the pro athletes had by far their fastest Kona bike splits, and the top-three men’s bike times all broke the previous record by more than three minutes! What was more important for Sanders was that he didn’t have to push much higher than plan to achieve such a good split, but he was able to still wear out much of the chase group behind him. Looking at the chart we can see that he made quick work of new bike record holder Cameron Wurf, whereas the rest of the main chasers were losing time from the start of the run. But what he was probably most worried about were the run legs of Kona marathon record holder Patrick Lange, one of the few athletes in pre-race contention who chose to hold back on the bike. In a different year this plan may not have worked out: A rule of thumb we have come up with for Kona is that in a windy year you can add five minutes to your time, and in a really good year you can subtract five minutes from your typical Kona bike-split time. Strong cyclists often prefer worse weather because it highlights their advantage over the others. Lange rode within himself for a 4:28:53 split, where last year he rode 4:37:49 (with a penalty). So removing the penalty, this year he still rode about four minutes faster this year than in 2016. While we don’t have his power data, he rode a very consistent race without any surges, so it’s safe to say it was in the same ballpark. This put him roughly nine minutes back of Sanders out of T2, and looking at the Quarq chart you can see that he and David Mcnamee started eating significant time out of the field right out of the gate. It wasn’t until right before the climb up Palani that McNamee fell off the blistering pace of Lange, but continued to make ground on the rest of the field, eventually settling into third. Kienle put up a valiant effort for fourth, after being in an unfamiliar place coming off the bike behind two athletes, but you can see his pace decline over the run—a pattern that mimicked all but a handful of athletes in the men’s pro race. The only member of the original chase group to end up in the top-five was James Cunnama. His decision to hold back just a bit on the climb might have been the difference between his fifth place finish and dropping out of the top 10. As for the top spot, anyone who watched the broadcast could tell that Sanders was definitely struggling in the later stages of the race, but despite this he still had the fourth best run split in the pro field. 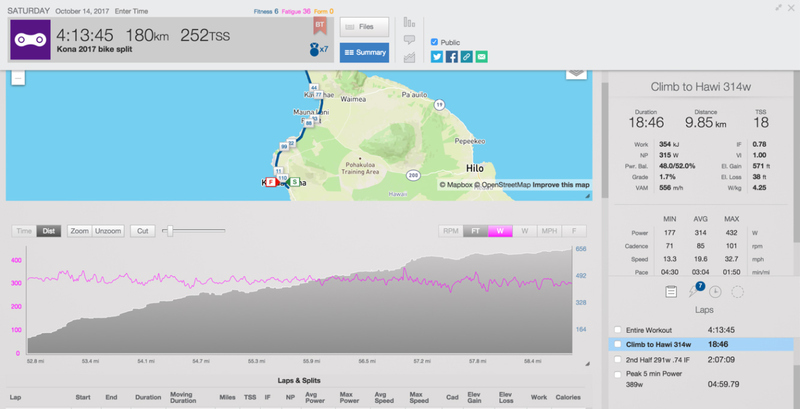 His pace really started to suffer on the Queen K, whereas Lange ran his typical consistent fast pace throughout, making the pass at mile 23. The end result for the championship was a difference of only two minutes and 47 seconds. For Lange it was the perfect day and for Sanders it’s motivation to fuel next year’s race— where the winds might just be in his favor. For fans of IRONMAN® there will be many more years of excitement to come and new technologies from companies like Quarq, TrainingPeaks, and Best Bike Split, allowing us to dive deeper into both the real-time analytics during the race as well as post-race tactical breakdowns in ways not possible before. The future is indeed bright for speed.